Welcome to the Australian Education Union. On this site you can find out about the huge range of activities, policies and campaigns we undertake on behalf of our more than 185,000 members and on behalf of public education. Our members work as principals, teachers and allied educators in schools, TAFE institutes, Corrections Education, Adult Migrant Education Services, and early childhood education centres. The AEU is proud to represent people who have the most important job in the country - educating people of all ages. We are proud to be advocates for a quality public education which is accessible to all Australians. The AEU represents its members industrially and professionally in diverse forums. This includes the maintenance of industrial protection and representation through industrial awards and agreements in all industrial tribunals in Australia. It also involves research, negotiation and advocacy over a wide range of matters including salaries and teaching and learning conditions. The AEU offers a wide range of services to members. These include professional advice and support, welfare assistance, health insurance, credit unions and discount purchasing. As the largest union in the education sector, the AEU is an effective lobbyist for educational resources at both Commonwealth and state levels. The AEU welcomes new members. Applications should be directed to the AEU branch or its associated body in each state and territory. Associated bodies are the Queensland Teachers’ Union, and the State School Teachers’ Union of WA. The AEU is a nationally organised union with a Federal Office in Melbourne and offices in all state and territory capitals as well as many regional centres. Click here for State and Territory Organisations. The union is a registered organisation under the provisions of the Fair Work Australia Act 2009. The union is governed by a Federal Conference which meets at least annually. 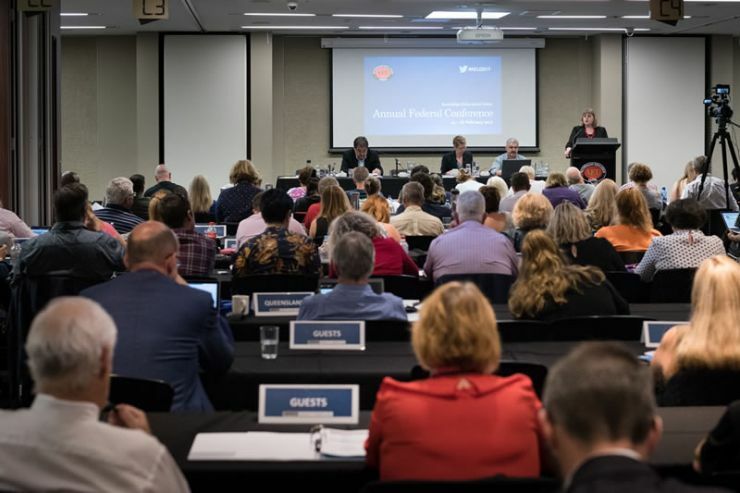 The AEU Federal Executive with representatives from all states and territories meets frequently and makes decisions about current issues and strategies affecting members on a national basis. Federal and Professional Officers of the AEU are responsible for carrying out decisions of the Federal Conference and Executive. The Federal Office has particular responsibility for campaigns and relations with the Federal Government as well as international relations for the AEU. Federal Conference is the supreme governing authority of the Australian Education Union. Delegates to Federal Conference include the Federal President, Deputy Federal President and delegates representing the General Division, TAFE Division and Aboriginal and Torres Strait Islander members in each state and territory of Australia. Delegates hold office for two years, after which time they may be re-elected. The AEU's Federal Conference meets at least annually to discuss the priorities and policies of the union. It also determines changes to the AEU Federal Rules and appoints professional officers to work in the AEU Federal Office. The Conference meets using a range of means, including face to face in February to set policies and to develop campaigns. Federal and Professional Officers employed at the Federal Office deal with a range of industrial and professional policy issues affecting educators. Officers are employed with specific job descriptions and qualifications in the areas of Legal and Industrial matters, Technical and Further Education, Women members, Educational Research and Policy, Aboriginal Education and International Relations. The AEU is affiliated to the Australian Council of Trade Unions, the peak body of Australian unions. At a state and territory level, the AEU affiliates with state and territory labour councils and provincial councils. Internationally the AEU is affiliated to the Education International, the largest non-government organisation in the world. AEU Federal Office Election Notice for the following office: Federal TAFE Secretary. The nomination form can be downloaded here. The AEC recently completed election E2018/195 for Federal Conference Delegate (General Division) representing the AEU South Australian Branch. A copy of the post-election report is available from the AEU upon request to the Federal Secretary at federalsecretary@aeufederal.org.au. The AEC recently completed election E2018/187 for Deputy Federal Secretary. A copy of the post-election report is available from the AEU upon request to the Federal Secretary at federalsecretary@aeufederal.org.au. AEU Audited Financial Report for the year ending 31 December 2018. The AEU is obliged, in accordance with the requirements of the Fair Work (Registered Organisations) Act 2009 and Australian Education Union Rule 77, to disclose the following information to its members.